Hello friends, I am still in Ulaanbaatar. I will be leaving in couple days to the north. 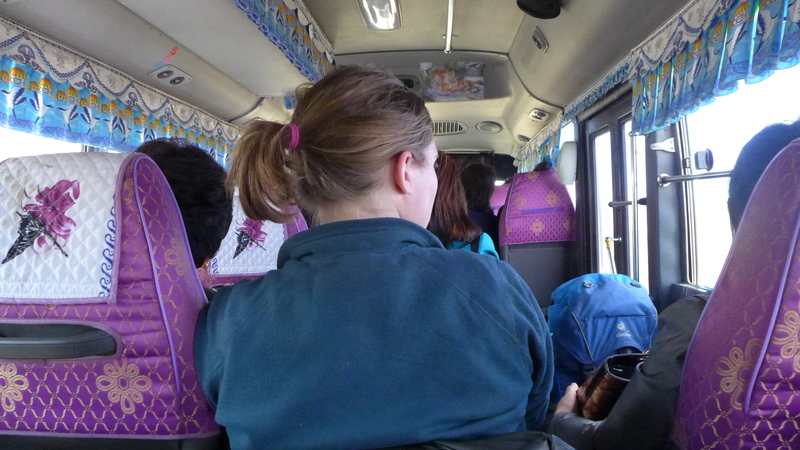 My friend, Heath, and I will go to Erdenet to visit some Peace Corp Volunteers and to do some sightseeing. I am looking forward to seeing my old college friend again. It has been over a year since we last saw each other! 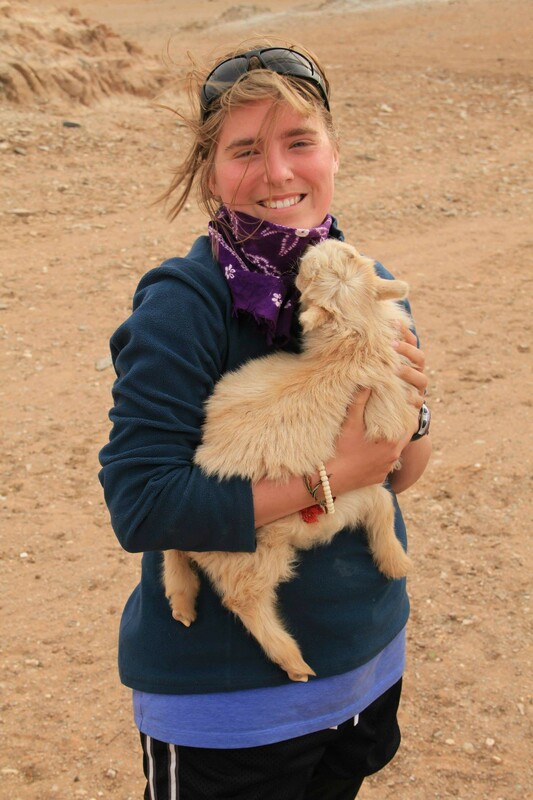 In my last post I told you about the end of my Gobi trip. Well, when we returned to UB, I met a German Biologist named Irina. She was my dormitory buddy. We introduced ourselves and became fast friends! I was in UB for a few days and got to know Irina and even joined her to the University to meet other biologists and professors. 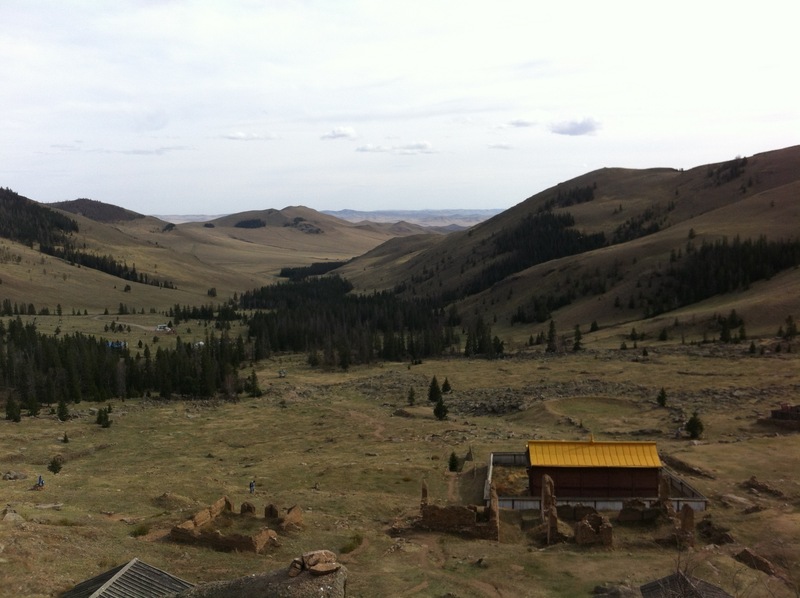 It was really interesting to hear what scientists are doing in Mongolia. There is an American researcher studying the badger population. There is a German professor who started the identification library for ants in Mongolia. 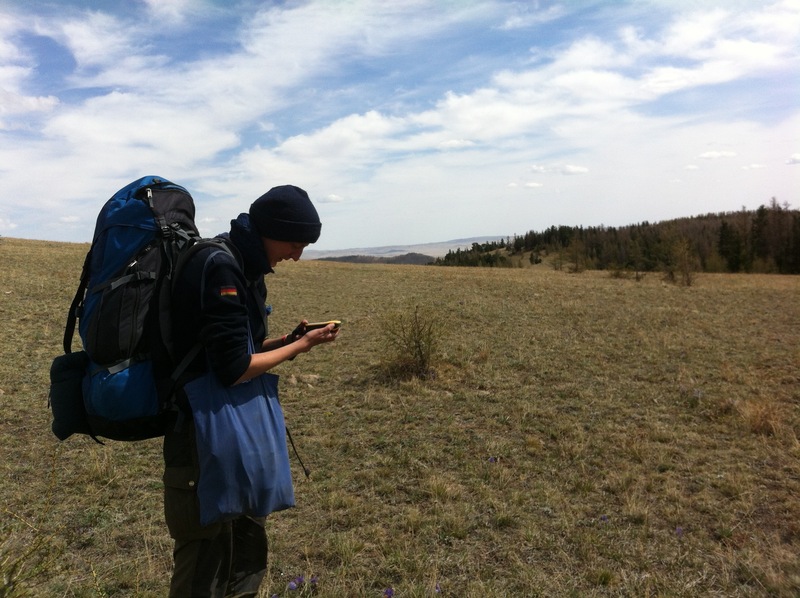 And Irina was lucky enough to join an expedition to Western Mongolia to tag some snow leopards. They were fortunate enough to collar one snow leopard and they got video of 3 other cats through camera trapping. 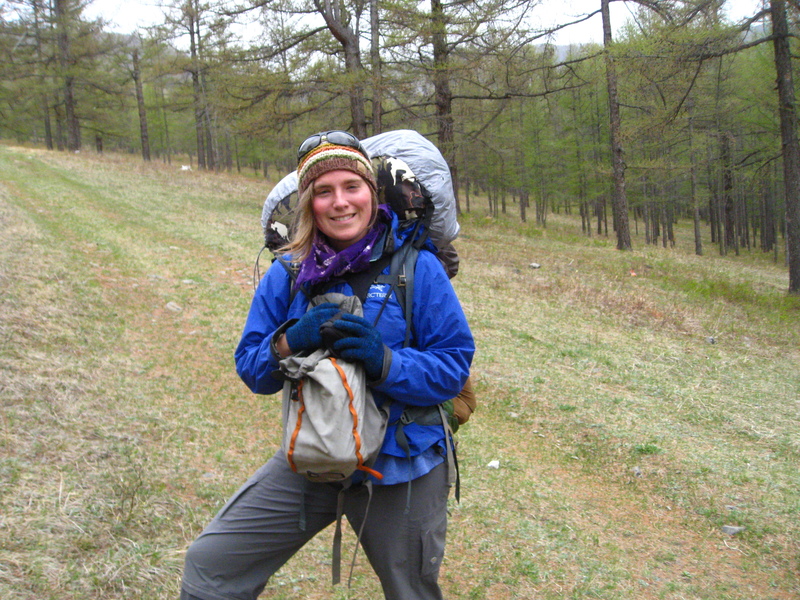 Irina was with the team when they collared the snow leopard, and she got to feel her fur. That is a once in a lifetime experience to see (and to touch!) a snow leopard. Just, wow! You can see why I really liked spending time with her, she is a total badass. 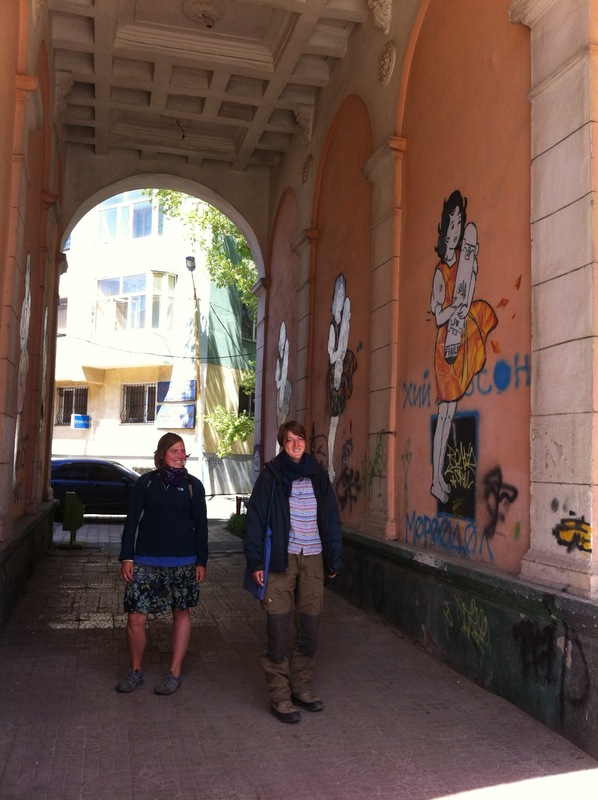 Here we are exploring UB. 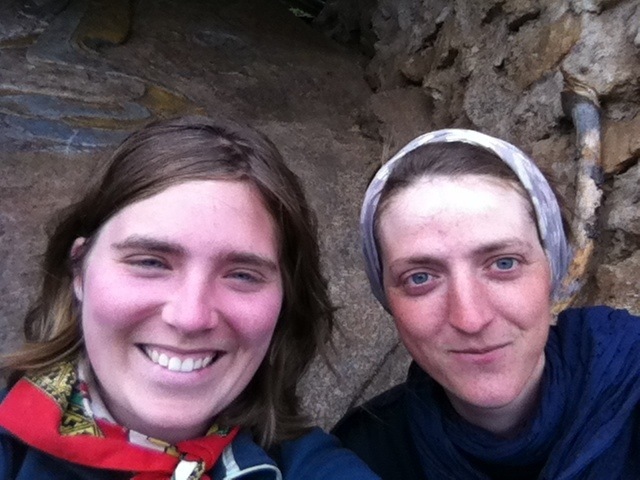 Irina invited me to join her on a camping trip to the Bogh Khaan Uul Strictly Protected Area, just south of UB. She said there was a monastery somewhere in the park and that she wanted to find it. I, of course, said yes and prepared for our 4 day camping trip. Irina had a stove, so I picked up some instant noodles, an onion, some peppers, crackers, cookies, raisins, oatmeal, and snickers bars. I also borrowed a sleeping bag from a biologist friend named Odko. I took a picture of the park map and Irina had a GPS just in case we got very lost. We were prepared! The next morning, some peace corp volunteers that were staying at the guest house warned us that a storm would come through UB that day. Irina and I looked at each other and shrugged it off. A little rain wouldn’t stop us. So, we set off by 10am and took bus #7 to its last stop. Irina heard that we could get into the park by a hole in the fence nearby the bus stop. So, we headed south, navigating through a ger neighborhood and construction area. We were lucky enough to bump into some workers who gave us a little of their petrol and directions to the entrance. We found the open gate and entered the park. 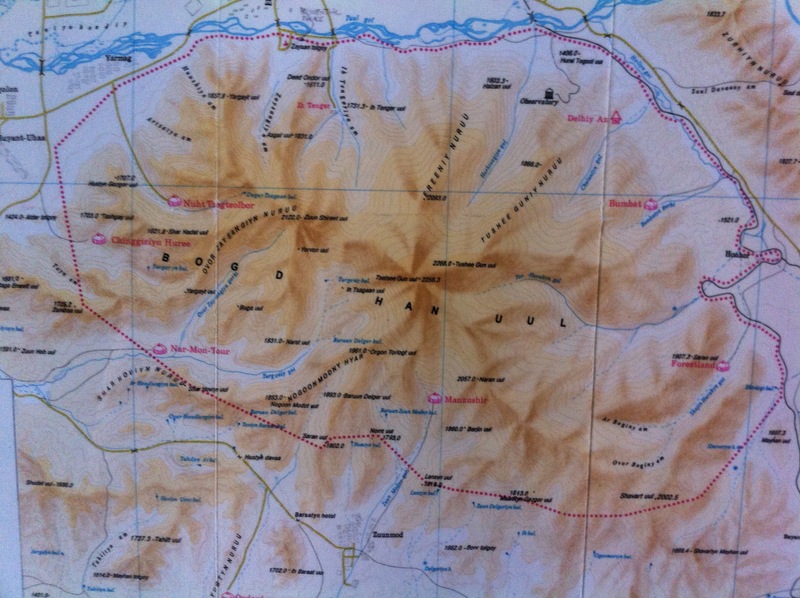 Our map of Bogh Khaan Uul Strictly Protected Area. I learned quickly that the park is completely covered in trees and mountains. It felt good to be in a conifer forest again. At first, we were following an animal trail (probably deer), but found an actual trail farther into the park and within the hour, it began to snow. It was a beautiful snow. They were large snowflakes that quickly covered the trees and the forest floor. 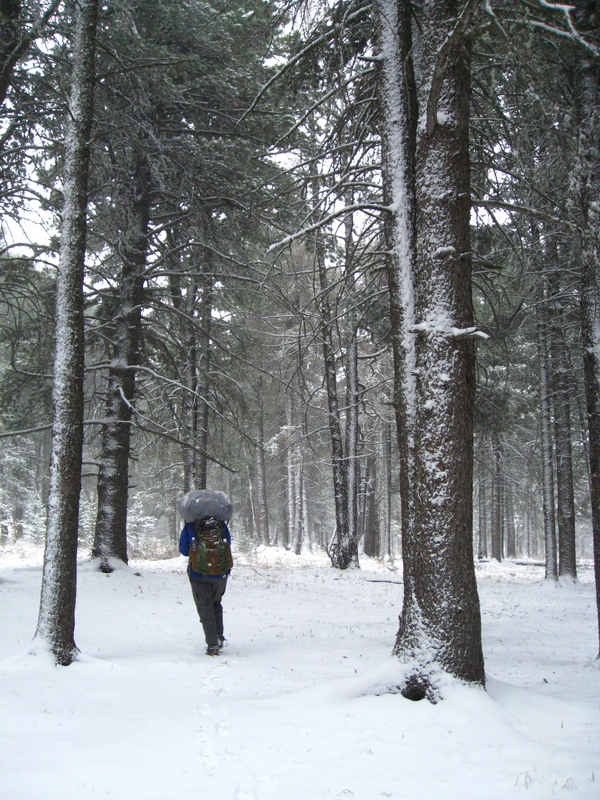 At first, Irina and I were bursting with joy to be hiking through a winter wonderland. The temperature was comfortable and the snow made everything look so nice. But, after a couple hours the storm got worse. The wind got stronger, the snow fell harder, and the temperature dropped considerably. That morning, we planned to cross the mountain path to a valley SE from our starting location and now it was crucial we did. There were moments when Irina and I wondered if we should head back, but we decided to keep going. We knew we would be okay if we kept calm and kept walking. By the time we reached the top of the mountain path, there was at least 1 inch of snow and it was growing more by the hour. The trail was getting harder to follow as well. We reached a crossroads at the top and were told by locals to follow the yellow marks on the trees. Irina and I were confused about these yellow marks at first. Were they flags? Well, a local told us to turn left at the crossroads and when we did, we saw them. We saw painted yellow squares on the trees. And man was that a lifesaver. By this time the trail was non existent except for a pair of footprints that we followed for awhile. By this time, it was almost 6pm and we only has 2-3 hours of daylight left. We had to quicken our pace. The wind was really strong at the top and was going right through my coat and fleece. The only way to stay warm was by walking. When we stopped for a breather/water, we would only stop for a few minutes and hurriedly get our packs back on because we were so cold. We reached the other end of the mountain pass by 7pm and could see the valley we were heading to. It was relieving to know we would make it before sundown. The snow was less severe on the south side of the mountain, but the wind was intense. I could not feel my hands or toes by this point. We reached the valley by 8pm and found a place to pitch our tent. The only issue was that the temperature dropped a lot and we knew it would only get worse throughout the night. Irina had a good sleeping bag, so she wasn’t worried, but my sleeping bag was not meant for this kind of weather. It was probably -3 C (25-26 F) around this time, and my bag is probably meant for 7-10 C (40F-50F). I knew I would not fair well if I only slept in the bag, so Irina and I used some of our wilderness survival skills. We were near a marshland and I saw a lot of tall grass that was magically dry. I took out my handy knife and started cutting a lot of the grass to use as a mattress below the tent. 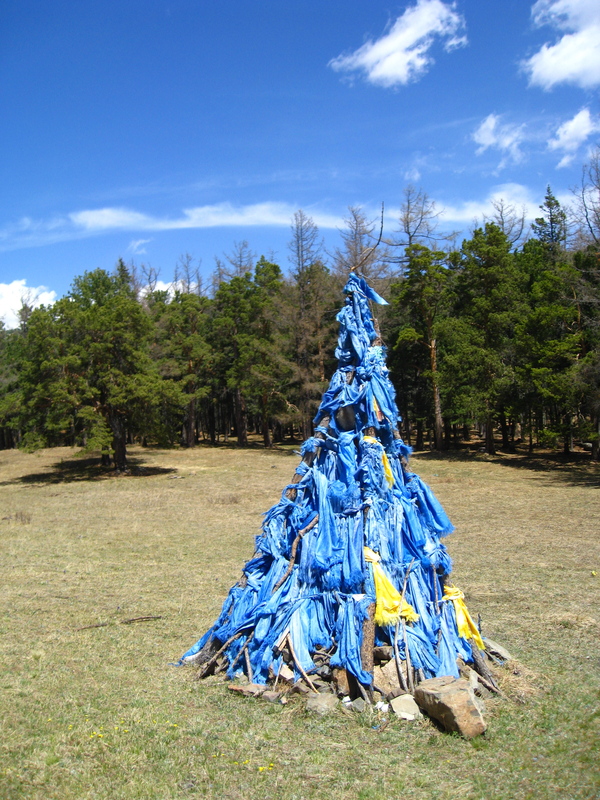 Irina cut down pine tree branches and began piling them as well. It was really difficult work because I could barely feel my hands. Even holding the knife was a bit painful, but I knew it would be worth it. 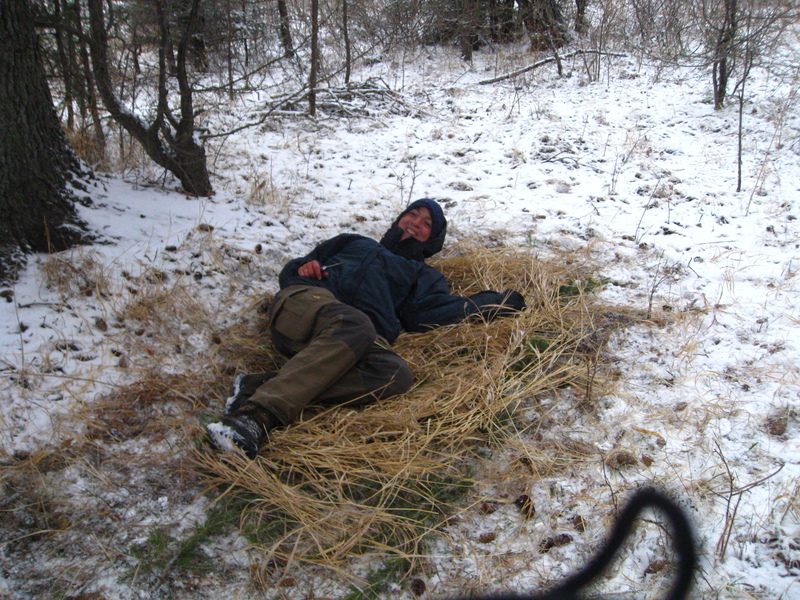 We piled the pine branches first and then laid the tall grass on top. And voila! We have our natural Sealy mattress. After a long process, due to our numb fingers, we got the tent up. By this time, it was dusk and it was getting pretty dark. Also, the snow stopped, but the wind had picked up. We boiled water for our instant noodle dinner and the heat from the stove made the tent warmer. To eat warm food after a long, cold trek felt amazing. We quickly went to sleep from exhaustion. Sadly, I woke up several times in the night shivering. To fall back asleep I had to force myself to shiver for minutes at a time and I would eventually fall asleep from exhaustion. I knew I wouldn’t die or get severe hypothermia, but holy cow was it cold! That was a rough night. I woke up the next morning tired, but warm. The storm had passed and the sun was warming our tent. I was so grateful for that. We had a slow morning. We dried our socks in a nearby tree and let the sun warm us up during breakfast. We didn’t head out until 12pm. On the first day, we hiked around 7 km (4.5 miles), which was farther than we had expected. So, we only had a few hours to walk on the second day. We had lost the yellow marked trail yesterday, but soon found it because the snow had melted away by the afternoon. We continued on the trail, following the yellow flags and yellow squares in the trees. 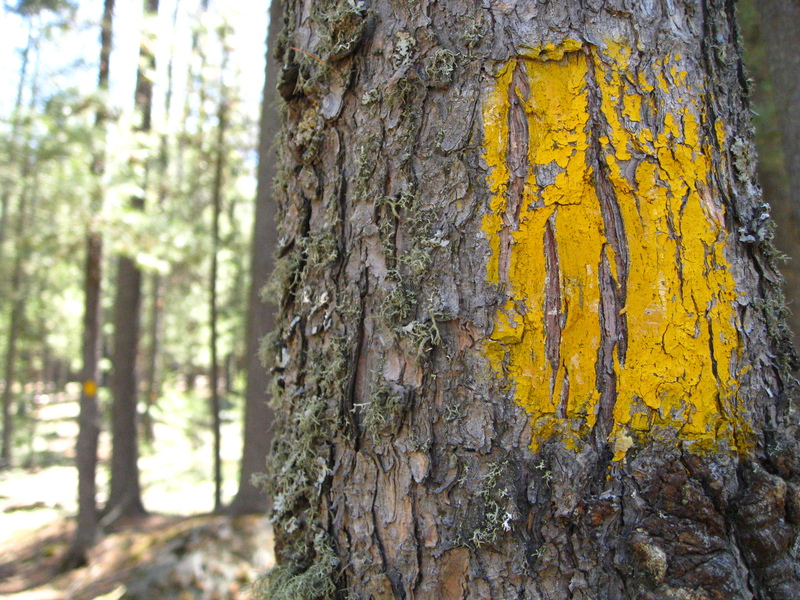 Our lifesavers: the yellow markers on the trail. You can see more yellow markers in the distance. We learned that the trail is very well marked in some areas and then completely stops in others. We lost the trail again and hiked around the area, looking for the next marker. We found some cool stuff along the way. We found a teepee made of branches and leaves. We also found fresh wild boar tracks. The birding was spectacular too. There were several kites (the bird of prey) and song birds around keeping us company. There we lots of black squirrels too. They were so cute. We ate our lunch enjoying the nature. 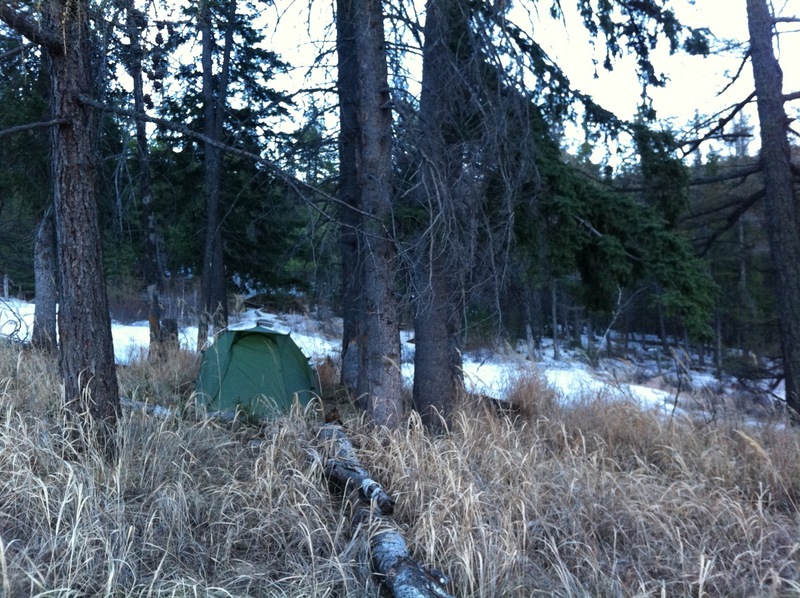 When we gave up looking for the marker, we found a nice place to pitch our tent beside a frozen stream. There was also a view of the valley below. 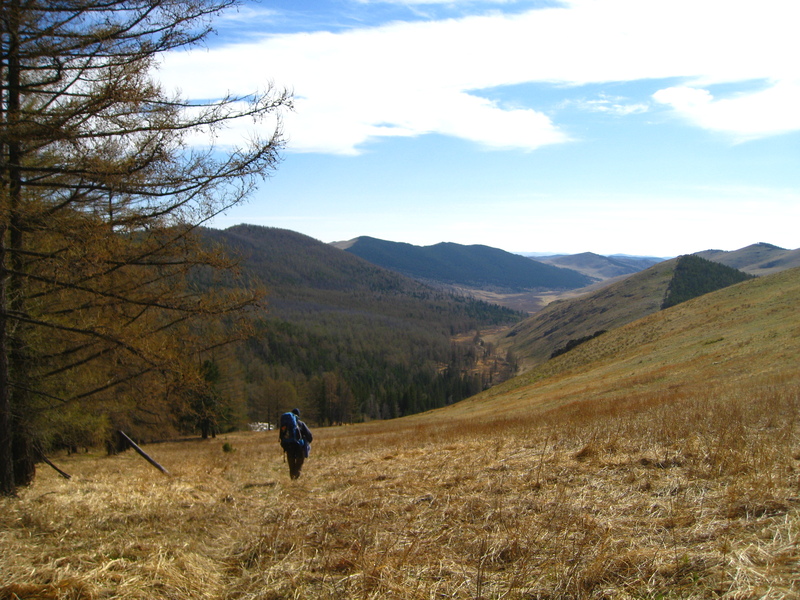 Irina pointed out that in Mongolia most hillsides are covered with trees on the northeast side, while the southwest is mostly grassy meadow. At the apex of the hill, the forest line just stops. I heard it is because of the harsh winds from the south. Interesting, right? Funny enough, when we were prepping our camp site we found our next yellow marker only 6m (20 ft) away. We relaxed and watched the sun slowly disappear from the horizon. We feasted on instant noodle and peppers. Yum! I slept like a baby that night. Our tent beside the frozen stream. We woke up the next morning, bright and early, ate breakfast (oatmeal, tea, and bread with jam), and headed towards our final destination: the ruins! 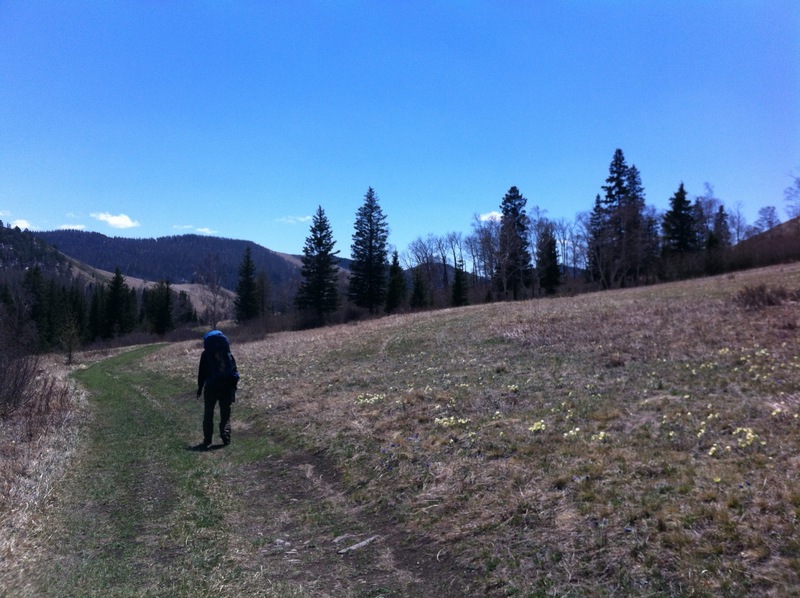 We hiked through a conifer forest again, but this time the weather was warm and sunny. Irina and I spent a lot of the time getting to know each other more. We found out that we are very similar, in almost every way (except I love horror movies). It felt like I met my long, lost German older sister. It is crazy to think Irina and I were traveling from opposite sides of the world and magically met in UB. I am so happy we met. A spiritual marker on the trail. Irina checking the GPS. We’re almost there! By the late afternoon we reached the top of another mountain pass and we saw it; we saw the monastery ruins in the next valley. That moment felt so good. We had done it. Getting down was the hard part, though. The yellow markers disappeared again, so we made our own trail. We roughed it through dense woods and steep hills, until we found the trail again. 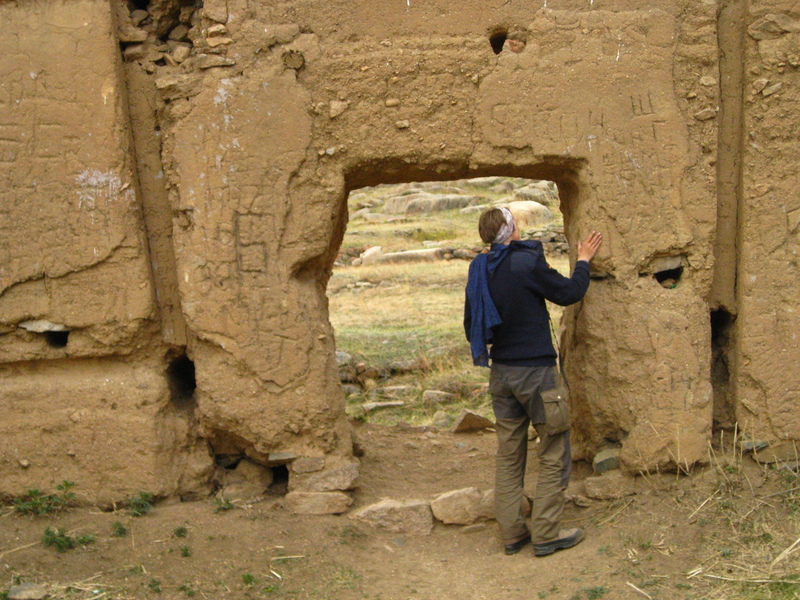 Soon enough, we exited from the forest and found ourselves surrounded in the ruins of a once bustling monastery. We set our bags down and explored the area. It was beautiful, in an unsettling way. We could see the foundation where many gers and buildings were and we could see the piles of stones that were once the famous monastery. There was one lone ger in the distance and we could see a man outside the ger looking at us through a small telescope. We waved to him and he waved back. He then walked towards us and introduced himself as Hiro. He started walking towards the one temple that was still intact. Irina and I looked at each other, shrugged, and followed him. The temple was a museum and he led us around. There were many pictures that showed the monastery grounds in its full form. There were some with monks in them too. There were no explanations about what happened and we tried asking Hiro, but the language barrier made it difficult. I am guessing the Russians came through and destroyed it. 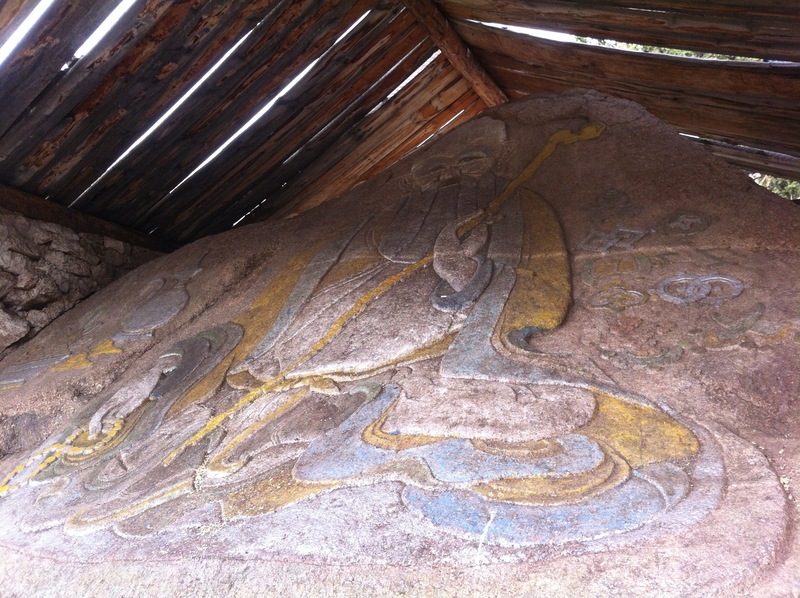 We donated a bit of money and then continued to the other famous part of this place: the monk rock paintings/etchings. Behind the ruins, there is a very steep cliff and on this cliff were many caves. Within these caves, were the drawings. The drawings were of Buddha. I don’t know how old they were, but they were very worn down. While in the cave, I felt I was in the past and I could sense the accomplishment and spirituality of these monk etchings. Irina and I stayed up on the cliffs for awhile, soaking in the moment and watching the sky change from blue to orange. We walked down the cliffs and spent more time exploring the ruins. 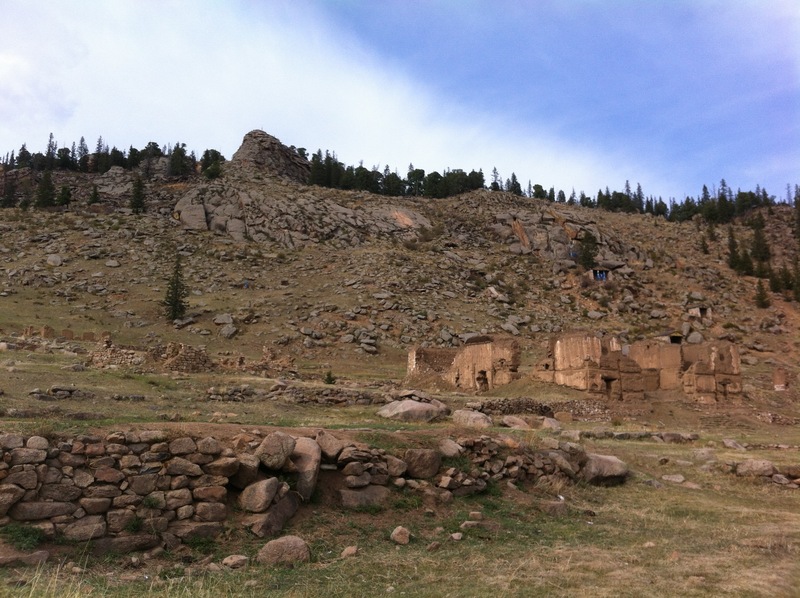 We walked inside the old monastery and looked at the nearby abandoned terraces. When we were finished, we waved to Hiro and he accompanied us to our final camping site. He helped pitch our tent and then we said our good nights. Irina and I cooked the last of our noodles and added a bunch of vegetables. As we ate, we watched the sun set over the distant hills. We could see the whole ruins from our camp site, and I found myself imagining what it would’ve been like, being here when the monastery was at its prime. I imagined all the monks doing their chores and how beautiful it must have been once upon a time. I wonder if the monks would’ve ever thought that their home would become ruins by the 1980’s. It made me a little sad. The next morning, Irina and I packed up our bags. We waved goodbye to Hiro and headed towards the nearby temple/ger camp. We found a road and followed it to a town that was about 2 hours away by foot. We found the bus station, thanks to a young local, and took the next bus to UB. Our wonderful camping trip was brought to an end. Well, I won’t post for a couple weeks. I’ll be traveling, but thanks for reading. I really appreciate it. That’s me on our way back to UB. We were the last to catch the bus, so we were on makeshift chairs. 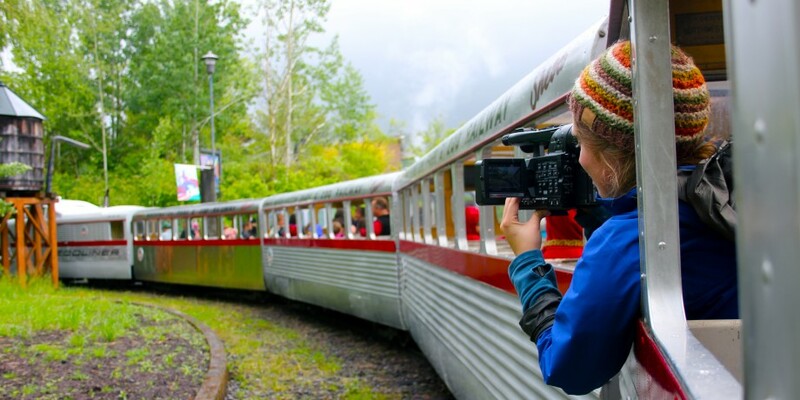 Hi Molly… such fun to follow your adventure. Hiking in a wild and foreign land, new friends & experiences. Well done. P.S. If you get a chance pick up these two books “Shadows of the Silk Road” by Colin Thubron & “The Great Game” by Peter Hopkirk. Excellent historical and current day reads by British Authors all about Central Asia. Great post! I’m so happy for you that you’re getting to have this experience. Love you and miss you my dear friend!